As promised here, this is a follow-up post with the tool I developed for the SharePoint to WordPress migration. Originally I’ve build a plain console application. Then I thought that a console application would possibly scare some users. And after some time I wanted to do some WPF again. So I created a WPF application, to wrap all the functionality into a GUI. This way it will be easier to use for the folks out there, who do not like black console applications 😉 Since I am using web services to connect to both blogging platforms, the tool can be executed on any client computer. No access to a server session is required. To start, you obviously need URLs to the source and destination blog, as well as credentials to the destination blog. Since most blogs are anonymous, you’ll probably not need to fill in the source credentials. The migration starts by hitting the “Migrate Content” button. That should be it for using the tool. It will remember the last entries for the URLs and login names, in case you need to perform multiple runs, which was the case for me. The passwords will need to be reentered for security reasons. It’ll show the progress of all steps in a progress bar and text at the bottom of the application and tell you when it’s finished. Existing categories are mapped to new categories and used as tag, too. I’ve tested the tool with three blogs, one being my own with installed CKS:EBE. There really isn’t much more to configure, to have your blog being migrated to WordPress with this tool. Some data needs to be modified, before the blog can go live on the new destination. In case of URLs this is necessary to generate valid links within the destination. Fortunately there is a plugin available to do some fancy rewriting. Since WordPress is showing its own smilies, I wanted to get rid of some strings within the posts, that reference smilies as images and replace them with, well, smilies. A txt file within the same directory with the name “replacestrings.txt” will take lines with strings for replacement. The tool gives me a good opportunity to explain some programming tasks, I used for the migration tool. I will explain some of them. SharePoint offers web services (_vti_bin/lists.asmx), WordPress an XML RPC interface (I used CookComputing.XmlRpc to connect). Those two are used to connect to the blogs. Since the SharePoint web services need Displaynames to connect to the posts and comments list, I first queried them by list template. Use the SharePoint lists web service, to get all lists of a site and search for specific lists like the posts and comments. The lists are identified by the used template. That way I do not have a localization issue. With the list names retrieved, I can query the lists for data. The web services use display names to identify lists. The method to actually query the web service for listitems. Properties of the class SharePointListConfig for the list title, ListItemCollectionPosition and Pagesize are simple string properties. The fields are specified, to get only the data we need for the migration. After all data has been read, local resources parsed and links replaced we move on to the destination side. As stated above, I’ve use an existing library. There are plenty of samples out there, if you look for them. I’ve implemented the following methods. I would like to tell you some issues I had, so you don’t get the same problems I had programming with the WordPress XML RPC interface. Just call the wp.deletePost method? Almost. You’ll have to call it twice to first move it to the recycle bin and then again to have posts being deleted permanently. There is no method to delete items from the media gallery 🙁 Fortunately items within the gallery behave like pages. So if you implement an call the deprecated wp.deletePage interface, you can achieve what you want (remember to delete twice). Both can be managed with the interface for terms the string for the parameter “taxonomy” will decide what to do. It can be “category” or “post_tag”. Other than that, the WordPress API is pretty straight-forward and easy to use. The download contains an executable, which is the tool itself, and a folder with the complete sourcecode. You just made something that I thought was so difficult be, truly, so easy! Thanks for the post! Thank you for the tool — I’m getting an error (404) — I was planning to go through the code and see what I could do to figure out the problem but I was wondering if you might be up to an email conversation so I can get you the updated code when I hunt down the problem. if you would like to supply improvements, you can contact me through the contact form (“Kontakt”). I’m having an issue getting the tool to connect to SharePoint online. I’ve used the public DNS name of my website PLUS I’ve tried the O365 tenant name (tenantname-public.sharepoint.com) and consistently get Access Denied. I did not test the connection to SharePoint Online. 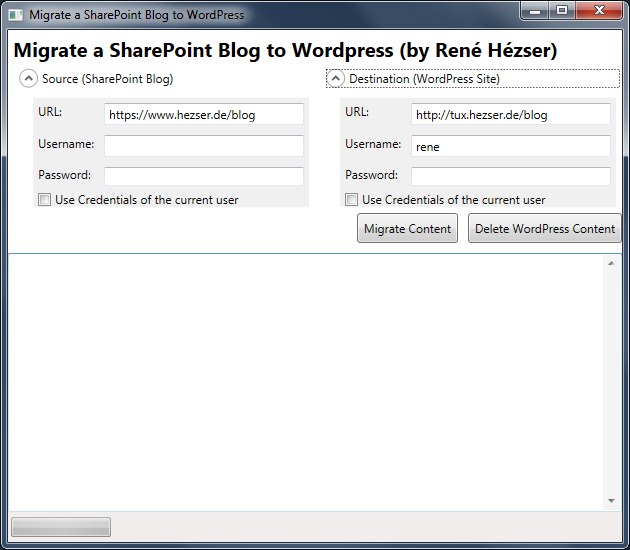 I ran across you tool when I got a request to move a SharePoint blog to WordPress. I did run across one small issue during the post retrieval process. The “Published Date” column is not required and may be empty. I’m guessing SharePoint substitutes “Date Created.” I simply wrapped you code to Convert.ToDateTime in a try/catch block and everything was good. My problem now is trying to connect to WordPress. I’ve doubled the credentials and they are correct but I continue to get a 403 error during the “Creating Categories” phase. Any ideas where I might being looking for the real problem? Could not load file or assembly ‘CookComputing.XmlRpcV2, Version=0.0.0.0, Culture=neutral, PublicKeyToken=null’ or one of its dependencies. The system cannot find the file specified. Where is this DLL available from? the assembly is within the solution items folder. any chance I could get you to complete this as a paid service for our website? did you try the tool? It should be easy to use. I’m getting the same error as Eric above, regarding the DLL. What’s the solution to the error? I’ve tried this on multiple computers and operating systems, and I’m not sure how to fix it. copy “CookComputing.XmlRpcV2dll” from the folder “ExportToWordpressSolution Items” to the root folder where the MigrateSharePointToWordPress.exe lies. Gedownloaded, getestet und wie erwartet auf den ersten Rutsch alles gut. So any idea why it complains about invalid XML ? How can i debug this further? Does your tool provide any verbose logging? And yes, 5 is the id of the newly created category. So this should be no error for your tool? Wondering if you can help. I’m using your tool and seems to function, however I get a 401 error when it attempts to create posts, but it does create the categories? Got 1295 comments and added them to their posts. Found 530 posts with references to local resources. The remote server returned an error: (401) Unauthorized. I have the same problem that Stephane Pepin, so I know how to solve this exception: The remote server returned an error: (401) Unauthorized. https://stackoverflow.com/questions/10205854/error-the-remote-server-returned-an-error-401-unauthorized. But not found the file that i have to edit. Got 81 comments and added them to their posts. Found 650 posts with references to local resources.